Peel Forest Park Scenic Reserve holds many important remnants of the podocarp forest that once covered a great deal of mid-Canterbury. The 783 hectares of forest, including Mills Bush, feature numerous large (but not particularly tall) kahikatea, matai and, most notably, totara. 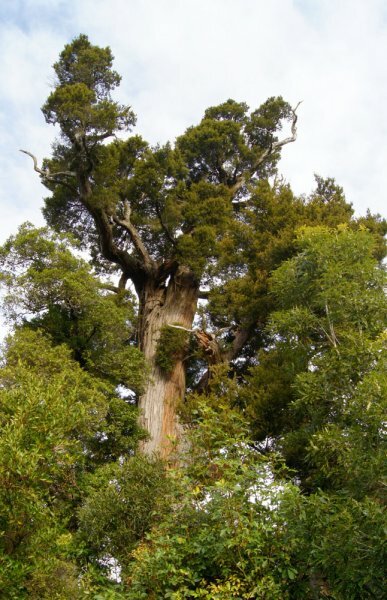 'Mills Totara', locally known as 'Big Tree', is probably the most photogenic of the many large totara in the reserve. It was featured as Tree 92 in the 1984 Burstall and Sale "Great Trees of New Zealand" book. Although labeled the "Big Tree", and at the end of the "Big Tree Walk", a larger, but shorter, totara resides in another part of Peel Forest Park, see record CR/1010 (Smillie, M. 2012). 'The preservation of the area, and the origins of what was to become Peel Forest Park by act of Parliament in 1926, was due to the foresight of a British visitor to New Zealand in 1881. Arthur Mills, M.P. for Exeter, who was accompanied by his family, bought the 16 ha. of forest that borders the road and south of the stone bridge to save the fine timber trees there from the logging which was carving into the forest. On his example, further lands were set aside as a scenic reserve; and although he did not return to New Zealand, his sons sold the 16 ha. after his death as much below value to the government for preservation. Since then further areas have been added to the park, which has a total of 773 ha.' (Burstall & Sale 1984). Ref: 'Great Trees of New Zealand' Burstall, S.W. and Sale, E.V. 1984, page 216. Some bare and lost branches, but plenty of healthy foliage (2012). First branches come off at 8 m.
20 Jul 2012 Smillie, M.J.
01 Jan 1984 Burstall, S.W. & E.V. Sale. 27 Jul 1970 Burstall, S.W. At the end of the "Big Tree Walk". The short track, with an uphill section, loops from the road to the Te Wanahu Flat campsite (30 mins return).